Every now and again at the Garden Web House Plants Forum, someone posts a thread inquiring about people's taste in plants. One question asked is whether we prefer plain green foliage or variegates, another popular one is whether we grow house plants mostly for their flowers or for their foliage. It isn't hard to figure out where I stand on this issue. After all, this blog is called "Life Among the Leaves," not Life Among the Blossoms." I do love flowers. Few things bring me more joy than seeing my outdoor garden in full bloom. In fact, I tend to err towards flowers outdoors--I don't have enough foliage interest going on there. It is something I intend to work on. 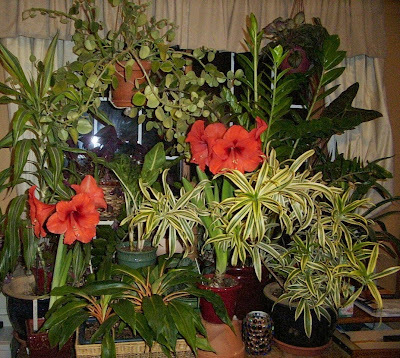 Also, I do grow a few houseplants strictly for their flowers: Hibiscus rosa-sinensis, Hippeastrums, and Phalaenopis orchids all have exquisite blooms and rather dull foliage. 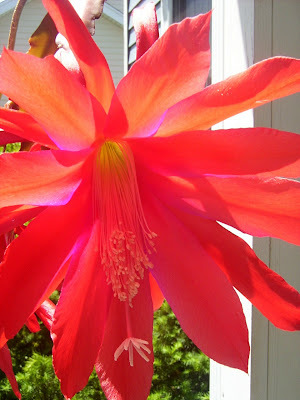 I think the foliage of epiphytic cacti, like Schlumbergera and Epiphyllum is interesting it its own right, but I don't think I'd be as interested if they didn't bloom as well. But for the rest of my plants, flowers are strictly a bonus--a sign that the plant is healthy. (I've heard that sometimes sick or dying plants bloom as a last-ditch attempt to reproduce, but that hasn't happened to me yet.) Beautiful or intriguing foliage is what I look for when I go plant shopping. Oh, and as to that variegated vs, plain green thing: I covet variegated plants of all sorts, but I think the most beautiful plant I've ever seen was a healthy, shiny, deep green Dracaena deremensis 'Janet Craig'. Second place goes to a well-grown Homalomena 'Emerald Gem.' Both plain green, they just seem to embody the essence of "planthood" to me. 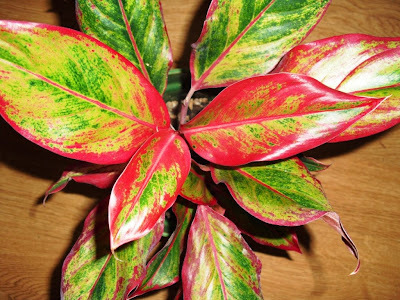 Oooh, color me jealous of your aglaonema (no pun intended). I can't wait to get one of those! Unfortunately my local greenhouse is still selling those beautiful new ags for top dollar, so it'll have to wait.